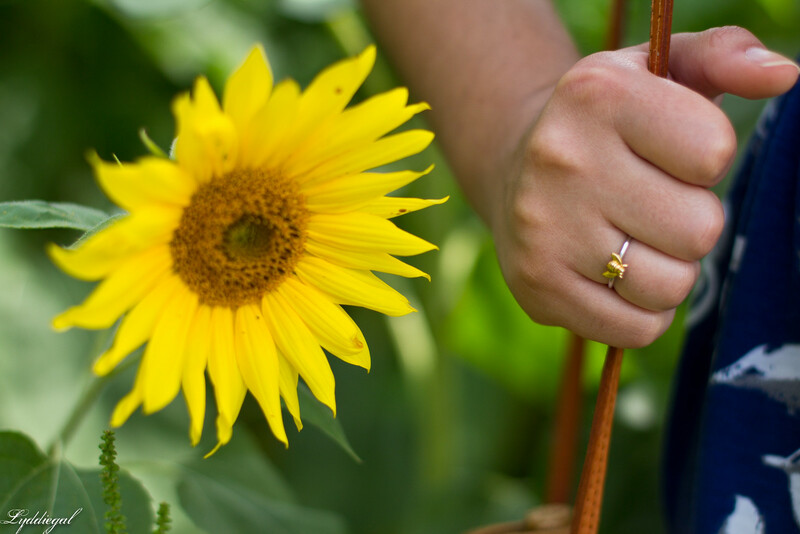 With a beautiful sunflower field so close to home, who needs to venture further? You probably beat a lot of crowds this way, too, and so much the better, as far as I'm concerned ;) I have to say, I do love how you seem to have the perfect dress for every summer activity, even if you don't always get out to do as many of them as you would like. The cut of this dress is so lovely on you, and the way the blue contrasts with the bright yellow flowers is just gorgeous. It's smart to wait to the end of the summer, because they wouldn't be as big in the beginning, I would think?? And what a fabulous back drop for your blue dress, Lydia!! 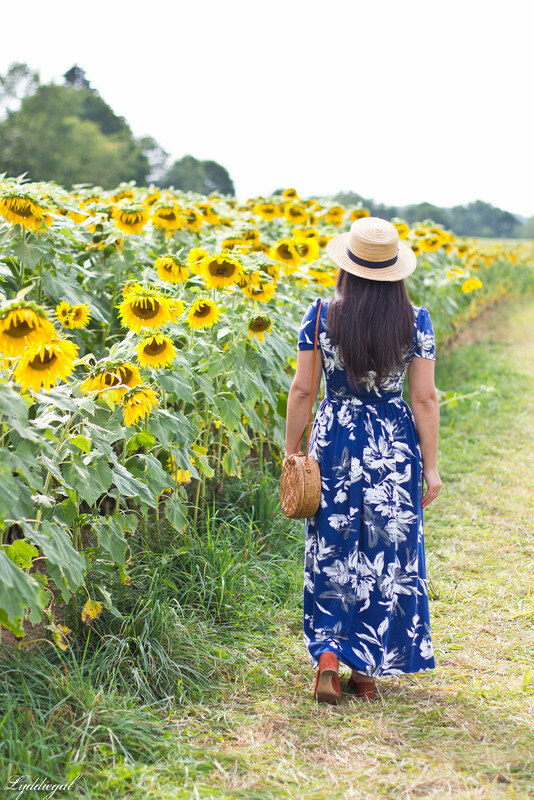 I think a sea of sunflowers might be the perfect background to your lovely dress. It really does make it stand out beautifully. Such a beautiful backdrop! Love this dress on you! Yay for scratching one thing off your summer list ! and its the perfect setting for pictures. I plant sunflowers every year however they're never that big but they are a real treat to watch grow.. and I usually let them dry and even eat the seeds. Kansas has quite a few sunflower fields- but I've never been, ha. I love these shots- oh-so-summer! How beautiful are these photos? I love everything about this look. 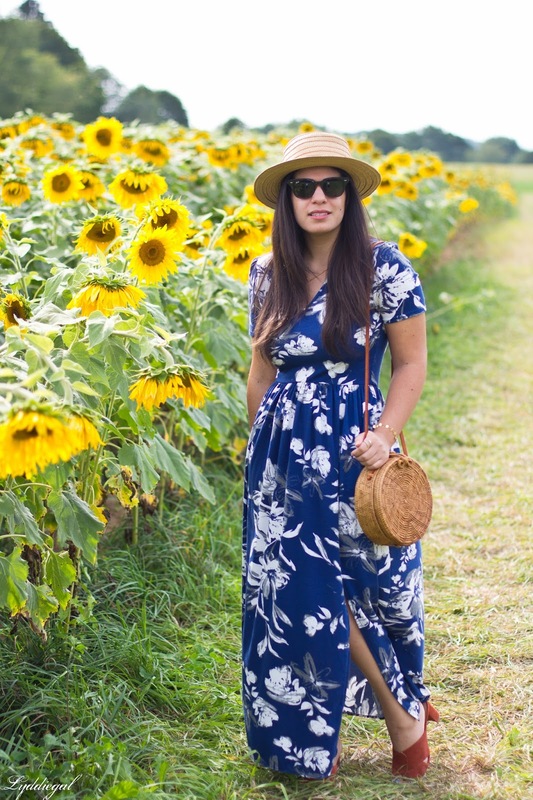 Your blue floral maxi and circular bag are so fabulous! 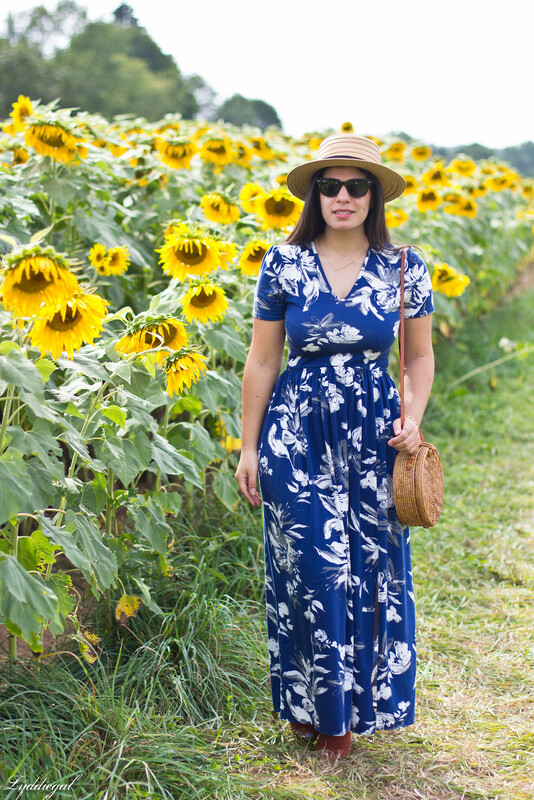 Those sunflower fields are amazing, and I just love this dress. Perfect for the photo setting. 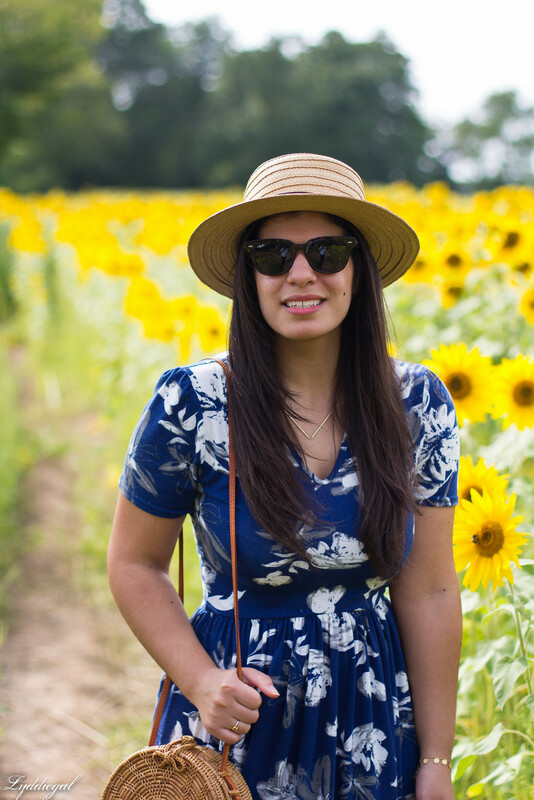 The sunflower backdrop is just amazing, such a good idea for a shoot! I love your outfit, that pop of blue is so pretty! What a pretty field, and I love the dress you chose to wear. It pops perfectly against the yellow backdrop! 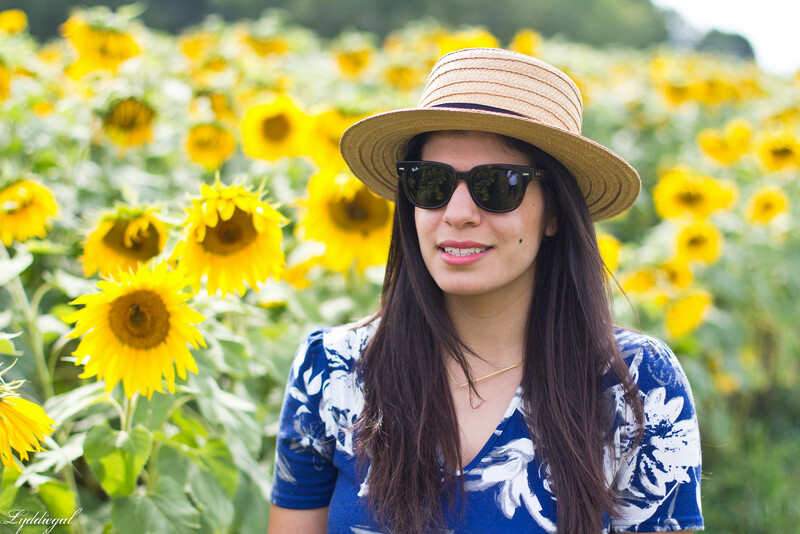 There is a sunflower field not far from me and I always want to go there but it's always really busy and the crowds have always kept me away. OK Now I really want to find a sunflower field by me and take some pretty pictures because yours came out great. It is important as a fashion blogger to have pretty backgrounds. Love the maxi dress and that it has sleeves which makes it perfect for Fall especially with those rust mules. Great bag and hat, too. =) You always have the prettiest wicker, straw or woven bags. I've never been to a sunflower field. It looks like a great time. Your blue dress looks great with the yellow flowers. 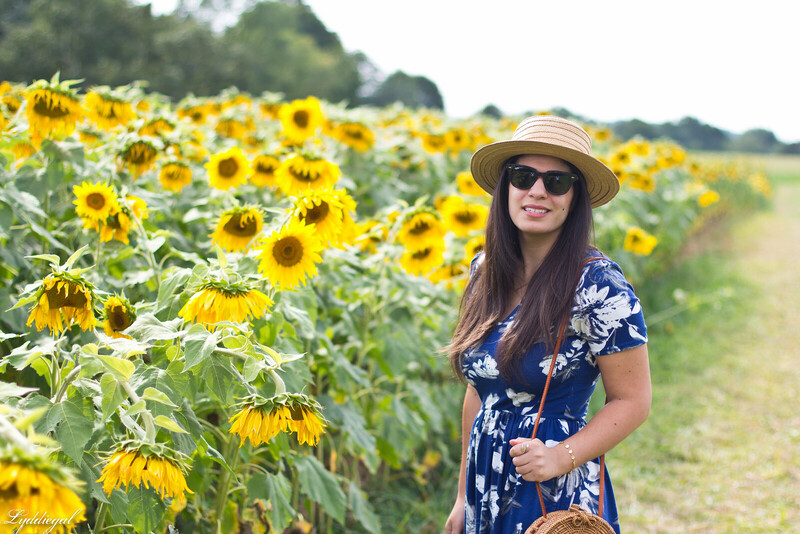 All those sunflowers are such a gorgeous backdrop. I love your dress and as always your hair is beautiful! I agree with staying close to home. You're able to get the same look without having to drive far! That field is beautiful! 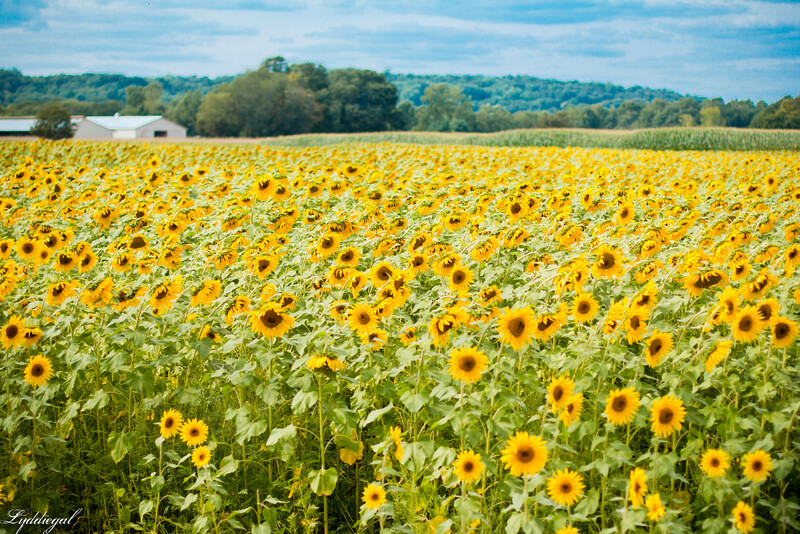 I wish there was a sunflower field near us. I love seeing a sea of sunflowers! 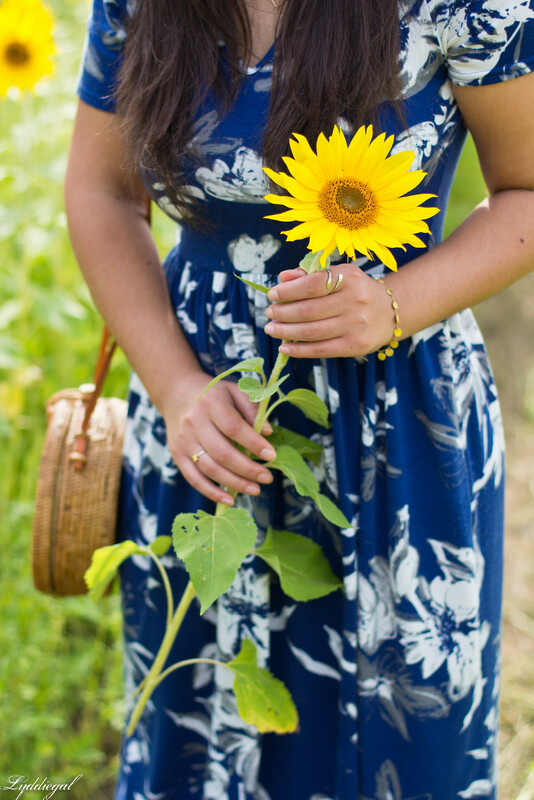 Your dress is beautiful on you and I love those pretty yellow sunflowers in the background! 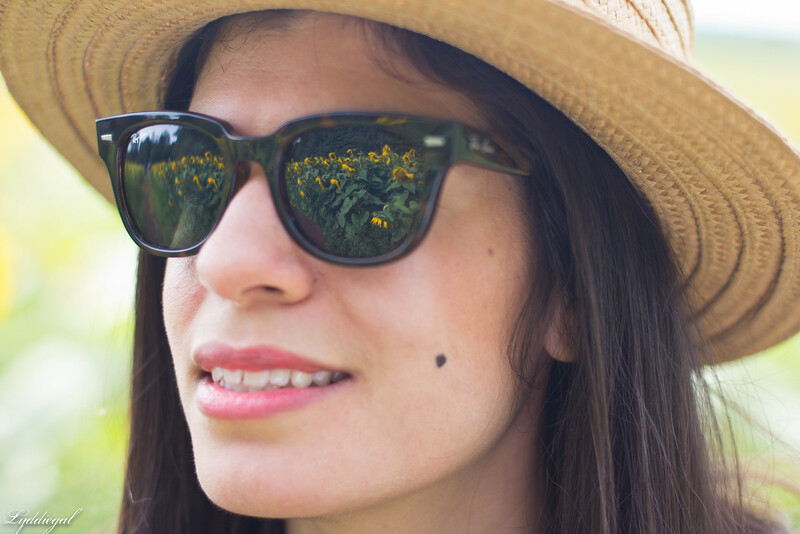 While I can appreciate the beauty of sunflowers, I don't like to get too close. 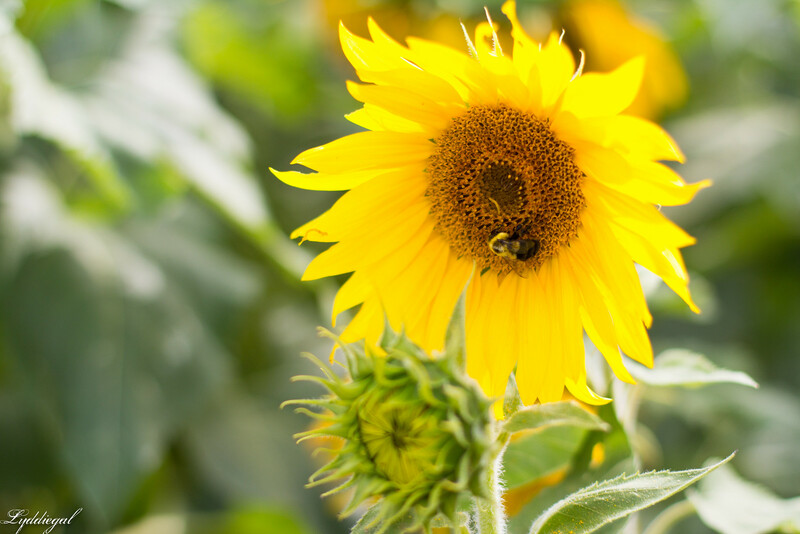 I'm terrified of bee's and they always seem to be buzzing around sunflowers in groups! This looks like an incredible place! I think there's something similar near me and you're inspiring me to go! 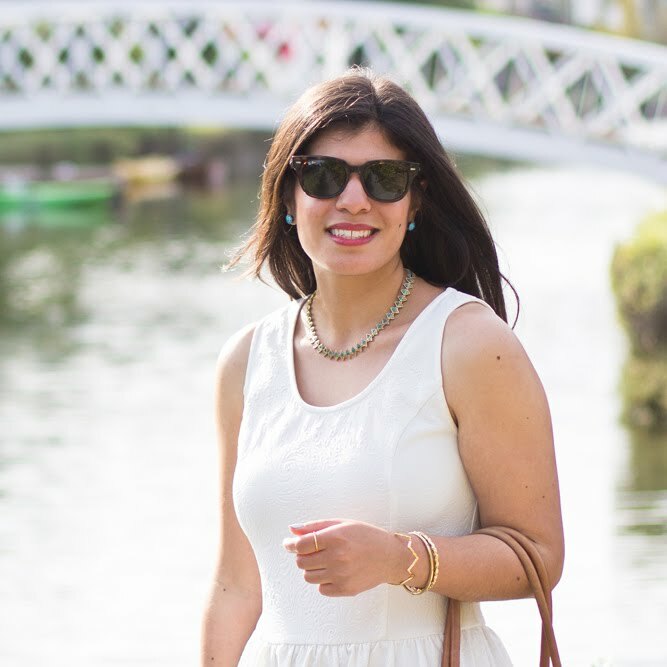 Love the pastoral look you wore, too! ohhh wonderful dress and love the location! 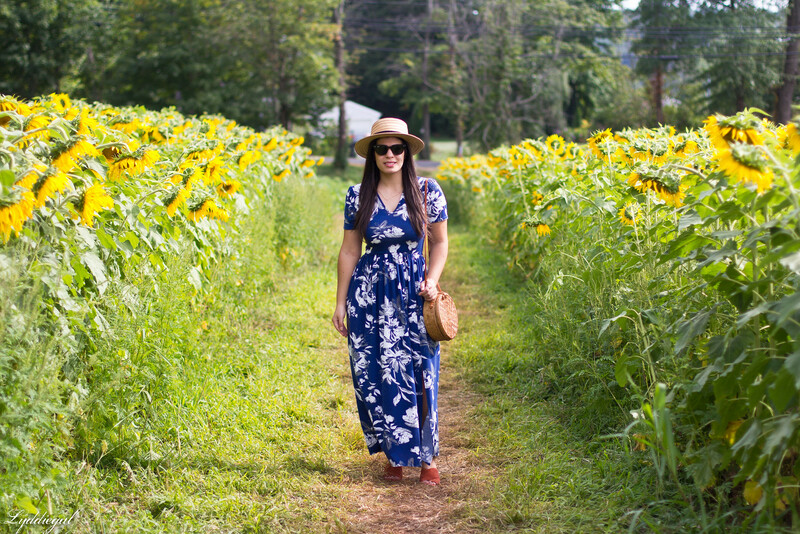 Your blue floral dress look stunning from those sun flowers. Nicely done photos, your background perfectly brings out the beautiful color of your dress. You're looking absolutely pretty as well babe. Beautiful photos. I too love sunflowers. They instantly make me happy whenever I see them! Love the outfit, by the way.